For quite a while now you’ve been tirelessly working on drumming up business for your day spa. Yes, it’s going pretty well. But spa businesses spring up like mushrooms nowadays. And you want your business to be successful. You want it boosted up the spa world ladder so your ideal customers can find you in a sea of undistinguished competitors. Based on common sense, a day spa is all about your clients. It’s all about finding a safe spa retreat from the hustle and bustle of city life. Trying to shift from living with one eye on the clock to finding much sought-after peace of mind. But how to reach out to the pool of prospects that need your services? And then build up your regular clientele that will swear by your day spa? So your true power lies in building strong relationships with your clients. They are the ones that will make your day spa famed by word of mouth. And if you do the right thing and invest in staff education, spa interior, day spa linen, day spa supplies, and high-end equipment – the good word is going to spread like wildfire. We’ve touched upon all these subjects, but have covered up many more leading-edge ideas and viewpoints to reveal a range of possibilities. You’ll see what you can create with a little imagination and investment. Browse by Category: Click on one of the links to jump to a selected category. How Can I Start My Day Spa Business and Make It Successful? First off, you need to muster the courage to stand out from the crowd. Then follow our checklist below to make your spa business really take off. We’ve worked tirelessly too to deliver you a selection of useful, smart and savvy, but equally interesting and innovative ideas. Using them can transform your day spa into a place of remarkable success. The bulk of 40 ideas comes from our extensive research and contributions from acknowledged experts in the industry. We’re grateful to them all for their invaluable input. If you’re a start-up day spa dreaming of making it big you’ll find some valuable tips here. And if you’re looking for ways to unleash innovation at your long-standing day spa you won’t end up short. Recruiting qualified people for your professional team is a huge factor in developing your day spa operating plan. It’s a landmark decision that could be a game changer for your business. Hiring the best licensed spa professionals will guarantee you high-quality services. Besides, they will help you build a strong reputation for your spa. Of course, you’re aiming at top talents who want to launch successful careers. But what can you do to attract and retain them? This is what Mel Kleiman, CSP, has to say about this in her article on employee recruitment published on the Spa Industry Association Website. There are some common things that everyone wants in a job, no matter what industry they’re in or which generation they belong to. A good supervisor and coworkers, work-life balance, opportunities to learn and advance and a sense of appreciation. Here’s how Balance Day Spa incentivises new members to join their team. They offer competitive pay, paid training and opportunities for advancement, among other perks. Now you know this, you can get straight to the point – find exceptional licensed professionals to join your team. Join the International Spa Organization, the leading global network of spa industry professionals. Once you do it, you can publish each of your new job openings on their website. You can also find top spa therapists through LinkedIn profiles. Now that you’ve learned this as well, what’s stopping you from building the best massage spa team in the world? Be confident about this. Nothing can guarantee you success as much as having good practitioners with hands-on knowledge. They are the ones who will mostly drive your sales. So, chose wisely and use your good judgment. We’ve all heard those horrid stories of poor spa hygiene. And how some of those scenarios ended in shutting down the businesses. So there’s nothing of more immediate importance in running a day spa than to guard the health of your clients. Day spas and massage spas are at an increased risk of bacterial and viral cross-contamination. This can compromise the health of your clients and make you responsible for it. Besides personal grooming, your therapists should be trained to maintain high hygiene standards. From hand hygiene and hand sanitising to disinfecting the tools and changing soiled linen. 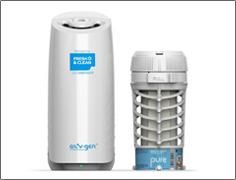 Oxygen-based dispenser that eliminates malodours and reduces carbon footprint. A case of a Santa Cruz spa is a good example of the repercussions compromised hygiene can bring about. Improperly cleaned pedicure tubs resulted in over 100 customers contracting a bacterial infection. The spa was shut down and the afflicted clients filed lawsuits against it. Also, whatever you do, don’t make a mistake of letting your clients notice any disregard to hygiene. It will never be forgiven. And you certainly don’t want to get a review like this on TripAdvisor. How to avoid these kinds of scenarios at all costs? 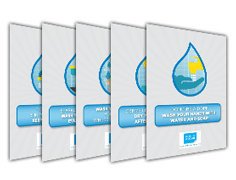 Find a hassle-free and cost-effective hygiene solution for your day spa. 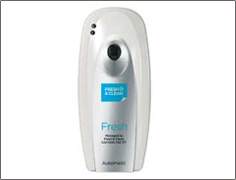 Fresh & Clean will get you covered with everything hygiene. You’re already rather familiar with your audience’s primary pain point. It’s wanting to escape the daily grind and de-stressing after a long day at work. So, the way your therapists treat your customers may decide between a positive and a negative spa experience. Providing good customer service must be one of the golden rules of your company culture. Your therapists should cultivate calm and reassuring demeanour. And being friendly towards the customers can help them blot out memories of a stressful day. Having therapists who know how to treat customers will make your day spa reputable for strong customer service. And that’s exactly what 75% of respondents in a study stated as the major reason to stick to a company. Encourage your therapists to relate to your clients on a human level. This will make them deliver the much-appreciated personal service. Start by calling your clients by their names. Offering them the garments they need. Get to know them, then use that knowledge to personalize their treatments. Show them you know how things are done. We’ve already touched upon this point in one of the previous sections. In a nutshell, if you want to keep talented people on board, give them opportunities for continuing education. Plus, attending regular workshops will help your staff meet the ever-changing industry needs. As a starting point, don’t compromise the quality of your staff. Hire only the best candidates. How to find them? Well, you will know them by the right attitude and a drive for professional development. The element of trust is also hugely important. And only the reliable candidates should qualify to take care of your clients. The magic formula is to combine high-quality professionals with continuous training. So, invest in your therapists’ training and let them learn from the best. It will brush up on their skills to take on the spa world with confidence. Australian Academy Of Beauty and Spa Therapy offers accredited courses you might want to explore. The academy is acknowledged as one of Australia’s finest training facilities. Consider online courses too, as they will offer your beauty professionals increased flexibility. Glow Expert Studio offers 24/7 access to online educational video sessions. They issue Glow Expert certification to their students upon course completion. For many spa professionals, the missing link in their educations is on-site exposure and hands-on training. So why not give young spa practitioners a chance to test the waters immediately? You can provide internship programs and keep some of the best candidates for yourself. Sounds pretentious or far-fetched? Perhaps it does, but it’s not like that in reality. What reality says, or to put it bluntly, what it dictates is for you to compete for industry talents. Full stop. The spa industry revenue has been growing over the past years. And the demand for spa services has increased due to a rising focus on health and appearance. However, the high-demand for spa professionals today far exceeds the offer. So, the industry is raising a pressing question of how to get to grips with this problem. Here’s how Global Wellness Summit Discussion Forum approached the staffing crisis problem. In order to meet the demand of $3.4 trillion mega-industry, we will need an additional 500,000 trained spa therapists and 80,000 experienced spa managers. Unfortunately, as of 2012, there were only 4,000 students enrolled in spa management programs around the world. No new data shows increases in enrollment. These numbers mean that we as an industry must take action today to increase the number of qualified employees. But what can you do to attract top therapist or even be more appealing to them than the bigger players? Well, offer family supportive policies, flexible working hours and less competitive work environment. Some valuable policies to be found in the harsh world of capitalism, don’t you agree? It’s important to keep good communication flow between your clients and practitioners. From the initial greeting phase throughout the entire spa treatment. This can help avoid any uncomfortable situations and misunderstandings. It can also help avoid mistakes that could lead to serious health consequences. You don’t want to end up doing more harm than good, do you? So, make sure your therapists inquire the clients about their medical conditions. Before they perform any treatments it’s mandatory to check if they’re taking any medications too. This could change the course of treatment. Experienced spa therapists will know if a certain condition raises a red flag. Whether a certain treatment can be performed or not. So, to avoid making any therapy mistakes, a good idea is to make a record of a client’s medical history. To illustrate, some massage therapies are not advisable during the first trimester of pregnancy. Also, extra precaution should be made during facial treatments after certain eye procedures. Ensure your spa therapists always think one step ahead for best possible therapy outcomes. There are certain rules of professional etiquette specific to each particular business. Being polite to your customers is a golden rule anyone working with people should adhere to. But what is considered acceptable behaviour for therapists working in day or massage spa business? First off, ensure your therapists give their full attention to each client. They should be ready at any times to give plush spa garments and perform spa services their clients will fully benefit from. This goes without saying. Your therapists should give your clients a warm welcome the moment they step into your spa. They should make sure to respect their privacy by practising draping methods. Next goes the explanation of the procedure the client will undertake. Then exercising caution while sanitising utensils before performing the facial treatment. They should always double-check the client understood the recommendations for their home routine. Offering a glass of water or a cup of tea when the therapy is over is a nice gesture you clients will appreciate. In the business, it counts big time how you present yourself. In spa and beauty business, multiply that by two, to say the least. When visiting day spas, people want to experience sheer beauty. They expect to see the elegance of form whatever they lay their eyes on. Your therapists are no exception. In truth, they are the ones that mirror the quality and standard of your entire business. So, take advantage of laundry services or linen rental so your staff will have immaculately clean, smart professional day spa uniforms everyday. Your staff’s professional and hygienic look will help enhance the image of your establishment. It’ll also set the stage for staff morale and exceptional customer experience. Nowadays professional spa attire design goes beyond just practicality. It stretches towards fashion and branding. Modern spa uniform design companies strive to combine functionality and style. So, you can choose from a wide range of styles. From Japanese tunic designs to yoga or fitness inspired uniforms, no name but a few. And you’ll choose according to your unique brand identity. So, create a presentable and unique look for your day spa team. Partner with Alsco, a company that offers linen rental and uniform rentals that can be personalised to suit your unique business requirements. Crisp and clean uniforms. Different sizes and colours. Laundered and delivered regularly. Ultra plush Kimono sleeve bathrobes with belts. 100% microfibre. Convenient service. 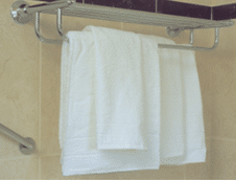 Quality towels that are regularly picked-up and delivered. Variations available. Wet facilities – it’s what defines a day spa and what sets it apart from a beauty spa or salon. The convenient synthesis of personal care treatments and the use of water facilities creates a sense of ultimate luxury. Day spas are so well-received because not everybody can afford to go away to a destination spa. It’s a place where people can experience a full day of pampering. And try to escape pressures of the outside world, at least for a day. The healing properties of bathing have been known to mankind over the centuries. Pools, jacuzzis, and showers are places where we can relax, surrender and regenerate. Likewise, regular use of sauna is linked to longer life and fewer serious heart problems. So let your pool and sauna area do justice to the word spa. Pay special attention to each detail to create a complete urban spa retreat for your clients. And make the use of the wet areas complimentary when booking spa treatment packages. If you still haven’t tried email marketing, don’t forget to do so. First of all, it’s cost-effective. Secondly, you get the chance to reach your leads and prospects. You get to reach current and even past customers at the time that is most convenient for them. Crafting clever email content with a relatable benefit for your audience is the first thing. The second is tapping into their common pain point. These two things will boost their interest in what you have to offer. You might want to encourage your clients to sign up for a newsletter on your website. That’s one of the ways to obtain their email addresses. Also, ask them to fill in the customer profile at your office desk and include the info about their emails. Your emails should include special offers and deals, but also establish you as an authority in the field. You’ll achieve this by giving your clients valuable information they’re searching for. As an illustration, Le Beau Clinic and Spa has launched an e-magazine. It’s packed with informative articles and people can subscribe for free on their site. But be careful to strike the right balance. Nobody fancies spammers. You might think of sending an “email blast” as legitimate marketing. But people overloaded with the emails might react negatively and be prone to clicking mark-as-spam button too eagerly. There are solid reasons behind why being labelled as a spammer is bad for your business. So, here’s how to avoid becoming one. Check out this amazing Spaprenour’s podcast. It showcases the huge potential of building email lists to boost your massage spa business. The podcast features Lynn Graves and Ramona Rice, both day spa industry seasoned experts. 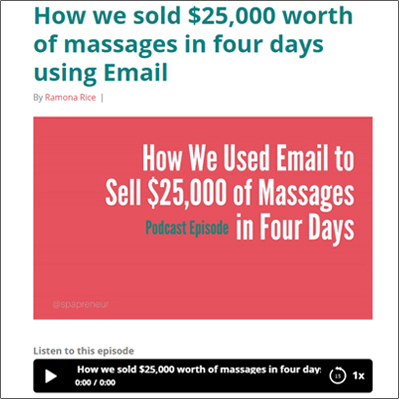 They reveal how they managed to sell $25.000 worth of massage therapies in just four days using email lists. It’s a brilliant case of flash sale. Since what they actually presented in the emails was a “6 massage therapy for 5” offer with a strict time limit. The sense of urgency along with appealing discount prompted impulse buying in the customers. The massage spas went like hot cakes! Listen to their podcast and find out more. Slipping into a plush robe is that specific spa moment when time starts slowing down. It’s the moment of transformation of just-another-day into the health spa day. 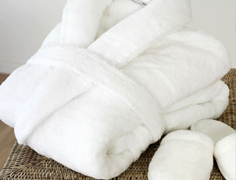 Your bathrobes and towels should provide your clients with a touch of luxury. Nothing less than that will suffice. Go to the google and check out ‘day spa images’ or ‘massage spa images’. Does it surprise you it’s plush day spa sheets, face towels and day spa linen that prevail in the photos? Candlelight and flowers are there to add up to the general impression. You know a picture is worth a thousand words. And these pictures reveal quite a lot about the importance of linen in a day spa business. The good thing about using a laundry service or a linen rental service is that it takes care of all your day spa linen needs. From hand towels, facewashers, bathrobes, bed sheets, staff uniforms, spa towels, etc. When your day spa business gets too busy, you can run out of linen supply. Spa-goers want to unwind in a neat and pleasant environment. Thus, your top priority is to ensure that you never run out of crisp and clean sheets, day spa towels and bathrobes. 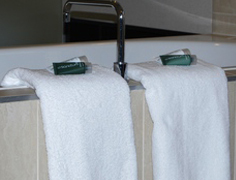 With Alsco’s Day Spa Towel rental service cleanliness and quality will be your trademark. 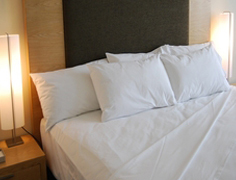 Alsco picks up dirty laundry and drops off clean bed sheets, linens and face washers for you. You’ll always have day spa supplies available at anytime. It offers utmost convenience for you while simultaneously cutting your cost. We offer a wide range of spa linen, day spa towels, bathrobes and day spa uniforms, in high-quality fabric, sizes and colours to suit your needs. 100% cotton Terry Toweling in different sizes and colours. Conveniently delivered. 100% combed terry cotton for maximum comfort. Select sizes and colours to suit your needs. White Sheets – Excel superior white sheets. 50% cotton and 50% polyester homogenous blend. Want to set a benchmark in the day spa business? No problem. Develop your own day spa app for iPhone and Android. There’s always a risk in making business decisions, but creating your own app is one of those low-risk ventures. Though it might be costly to engage an app developer, eventually this will save you time and money. Your front desk workers will have more time and energy to dedicate to your immediate customers. And your customers will be able to reach you at the touch of a button. Sounds exciting? Well, this is how it works. Building your own mobile app can make browsing services, booking and appointment reminders a tap of the screen away. Your customers could get notifications on special offers and discounts straight to their mobiles. With new game-changing trends shifting ever so often, day spas are reaching for mobile marketing apps. They use them to track their clients and offer deals in real time. Sending out a push notification saying “Come within the next two hours for 35% off!” sounds like a proposition valuable enough to lure the clients to your spa. Amy’s Day Spa has made an invaluable step towards great customer experience by creating their handy app. Their clients no longer have to dial the phone to book an appointment. The app enables them to do it on their own and optimize their time. Swell, right? 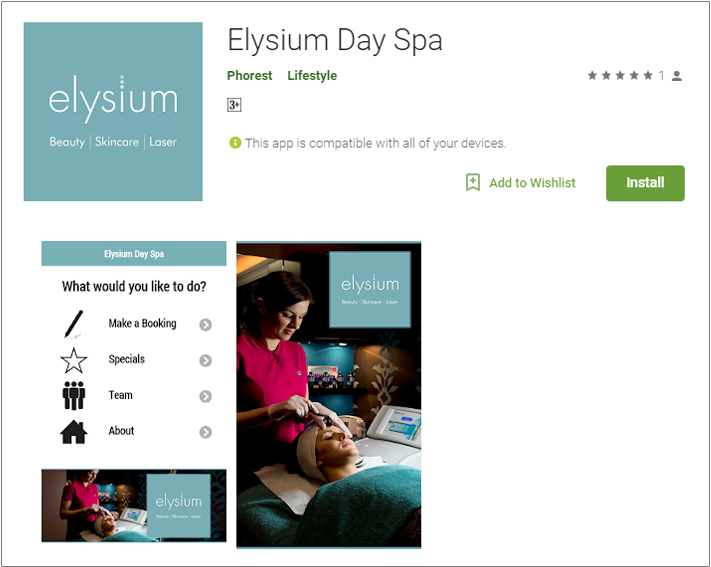 Elysium Day Spa offers their clients an app for booking outside of opening hours. This app also enables them to keep a close eye on the latest special offers. Pretty convenient. Or if you’d rather not invest in your own app, check out this amazing list of beauty spa and massage spa business apps. It’s a treasure trove that’ll help immensely in running your day spa business. From handling booking and accessing forms, to creating client profiles and checking product ingredients. Pretty much everything is covered. Imagine you want to create a strong brand voice. You want to maintain an authentic connection with clients today. Without the Web? No way! Lisa Starr, a business consultant and educator, advises hiring a sales and marketing person. They would manage your social media, respond to reviews and update your website. Maybe you intended to bypass hiring a professional to pinch pennies. But that’s probably because you weren’t aware of the next thing. Eight out of ten consumers check online reviews before making an appointment or purchase. Having second thoughts already? Good. Getting visible in the world of social media means staying relevant. A dermatology expert, Beth Bialko, reminds us of the preference of personal recommendations. Even in the online world. Using social media helps an entity or location seem more authentic, fun and relatable”, she says. “That’s why companies craft collaborations with influencers to help amplify their brand awareness, create buzz and reach new audiences. There’s a little to no effect in putting all your marketing eggs in one basket. Ryan Christie recommends promoting new products, services and milestones on your Facebook page. While getting involved with business communities and potential customers on Twitter. 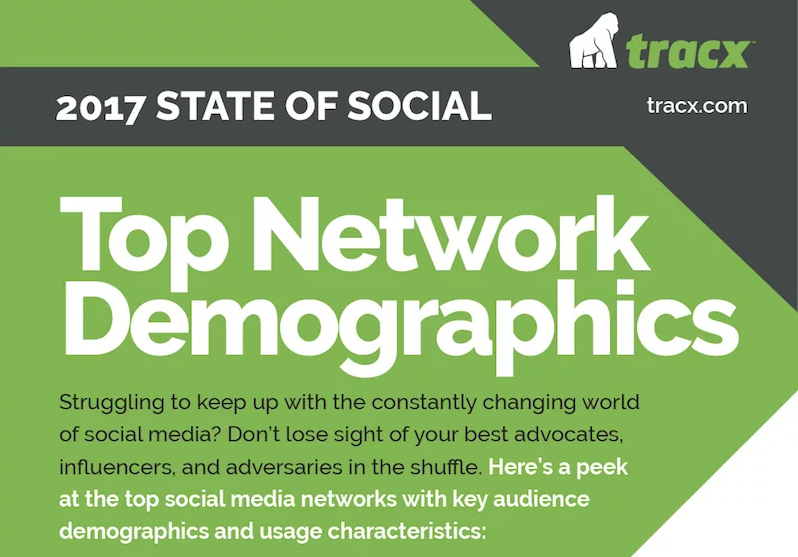 Yet, gaining an insight into social network demographic stats will maximize your social media marketing effects. Check out this infographic. It will help you clear the way through social media wilderness. And reach your target audience. 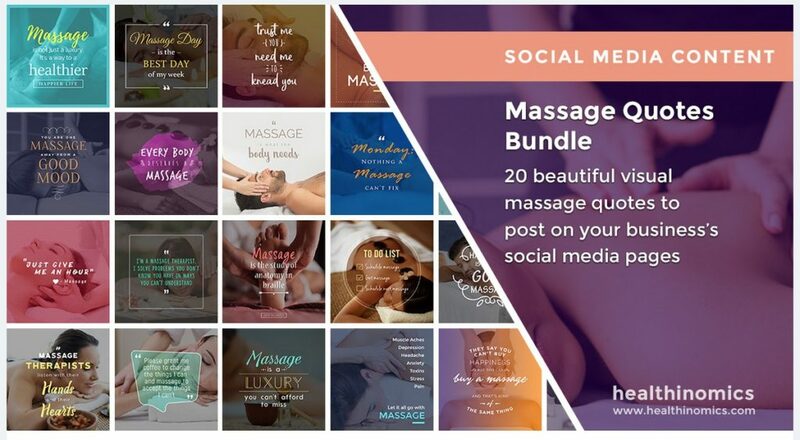 If you still want to manage your social media marketing on your own, try out these massage quote bundles. These are masterfully designed visual motivating quotes. You can post them on your social networks without taking much trouble yourself. The quotes are made with a fresh approach to inspire and grow your social media following. But making use of templates such as these is simply not good enough if you want to be seen and heard. You need to give your best and excel at creating amazing content for your social media followers. Use powerful language to make your prospects feel all the sensory benefits you offer. Even before they come to you. And check out Free Spa Social Media Content for some more ready-made social media promotion materials. Get access to images, a done-for-you newsletter article, ads and more. It’ll be delivered straight to your inbox. Gael Wood, a savvy expert with 20 years of experience in the business, offers Client Attraction Bootcamp too. It’s aimed at helping spa owners grow and maintain a thriving spa business. Starting from your treatment rooms and washrooms, all through to your pool and sauna areas – cleanliness is the law to obey. We’ve seen in one of the sections above how a lapse in cleanliness can lead to hazardous consequences. 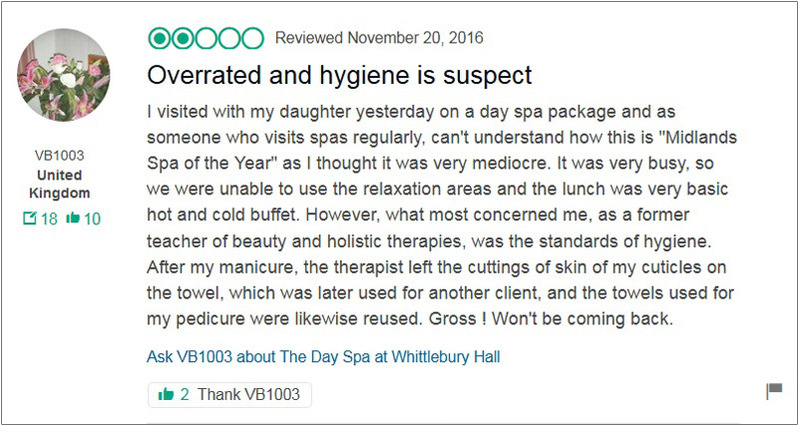 If anything, your day spa must be reputable for its superior hygiene standards. It must look inviting at all times, no matter how much traffic comes through the door or how bad the weather is. Teach your therapists to keep an ever watchful eye on the equipment cleanliness. They must make sure it’s properly sterilized. You don’t need any insider tips to know that your pool and sauna areas need to be immaculately clean. It’s your responsibility as the business owner to ensure your guests leave your spa safe and sound. So think about a smart solution that will tackle all your hygiene problems. Opt for a rental service that will cover everything for you. 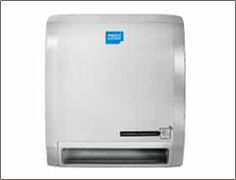 From automated hand sanitizers and surface disinfectants to complete washroom services. Also, it’s a good idea to put up posters in your washrooms that will testify on the standards of your cleanliness. This will reassure your customers and give them the much-needed peace of mind. Make sure your day spa therapists know proper hygiene etiquettes. Free Downloadable posters. Inculcate the importance of good hygiene at your day spa with these eye-catching hygiene posters. The power is in your hand. Keep it clean and hygienic. Posters in A4 and a3 sizes are available. Want to differentiate yourself from your competitors? Try the tested way and offer treatments that will deliver the desired experience. Get inside your clients’ heads and pinpoint the reasons they come to you in the first place. Your body, hair and facial treatments need to combine beautification and enjoyment. Turn your treatments into relaxing rituals. And be sure memories of them will come flooding back to your clients. It’s expected that your treatments provide your clients with physically relaxing experience. But ensure that they feel mentally well too when spending their hours in your spa. Beyond a shadow of a doubt, they’ll want to return. We present you with Jeremy McCarthy, director of spa development and operations at Starwood Hotels & Resorts. Here he’s addressing the topic of the ability of spas to make us feel good. What we do really well is provide healing that feels good because there is no other healing institution that people look forward to going to, that people enjoy when they are there, and that people remember fondly afterwards, the way they do spa. Now, take a look at this Global Wellness Summit video. It gives a fresh perspective on the relationship between beauty and wellness. Mark Wuttke, a renowned spa expert, discusses the challenges the beauty industry will face in future years. He touts the importance of introducing individualisation, personalisation and more bespoke experience. And advises that the focus should be made on making people feel comfortable in their own skin. To gain a competitive advantage, your day spa should feature an extensive offer of finest treatments. Day spa and massage spa industry are growing exceedingly. Meanwhile, we are witnessing an insane amount of therapies popping up in the market. And you’re well aware of how important it is to keep pace with changing trends. Of course, it’s your job to keep up with day spa current vogue. But one can never be too careful, especially with fads that come and go. It’s critical to address the needs and recognize the tastes of your diverse target audiences, yes. But don’t go over the border. Often less is more. Follow your clients’ needs, instead of getting carried away with the plethora of spa and wellness therapies that are on offer today. The concept of user experience (UX) is getting increasingly popular in the digital world. But it is slowly getting introduced into the spa business as well. And it’s no wonder since the day spa world is getting saturated with competitors. Keeping up with consumer-oriented trends is becoming indispensable. And things are changing. Day spas are tapping into the concept and getting more engaged with their consumers. So, tackle some of these UX issues to get more customer-oriented, optimise your business and drive more revenue. You can start fixing small-sized lockers, bad sound insulation, and narrow or uncomfortable treatment beds. Staying authentic and original is the thing that will make your clients want to choose your day spa over another. People are getting satiated with regular and average experiences. They want to step out of the ordinary, to recover from monotonous, repetitive routines. That’s what they expect to find particularly when they step into your day spa. They yearn to forget the ordinary and experience the extraordinary. It’s not only about beauty, pampering and relaxation. So, go on and provide your clients with what they need, you can’t afford being just another massage spa. Spice up your customer relationships with a genuine approach. Encourage family atmosphere, get unpredictable. Gone are the days when having regular spa treatment services would suffice. Offer personalized treatments tailored to your individual customer’s needs. Treat your customers like superstars. Harbour Day Spa, for instance, provides their clients with Special Celebrity Facials. Looking for that extra special treatment tailered just for you? “Our Celebrity Facial” might be just what you are looking for. Tuesday Or Wednesday special only! Or learn from Ramona Rice, the owner of DeStress Express, a day spa with 20 years presence in the industry. She’s had the opportunity to watch her family business grow first-hand and close-up. Here’s what she has to say about the importance of stamping your personality on your day spa business. Here is the stereotypical spa: quiet, calm, muted colors, snooty. Here is our spa’s, DeStress Express’ personality: a combination of sassy and serene. We have fun with our clients, we embrace things like random cupcakes, bets involving waxing body parts, and we typically laugh at those clients who might suggest “happy endings.” (But we always report them to the police if they are aggressive). We provide serious massage and skin care that gets results. If we tried only to be “typical spa” like we wouldn’t work as a brand and we would not be celebrating 20 years of business success. We would not have built the loyal tribe of “DeStressers” who are devout followers of our brand. Don’t hide your authentic self – own it, and your tribe will build. The number of spa-goers is increasing at an exponential rate each successive year. So does the number of newly opened day spa businesses. Each setting a new benchmark for you to measure against. The generation of baby boomers is stepping into their golden years. This is interlinked with increased interest in day spa services and anti-aging products. But spa audience today reaches far beyond baby boomers and comes to include young adults. Even teenagers. Many spa businesses hand-pick the products that deserve to be featured in their day spa. That’s how they intend to differentiate themselves. Choosing your products carefully will place your spa business at an advantage. So, select exclusive, first-class products. Then connect them with your brand to reflect your unique brand identity. Endota Spa, Australia’s largest industry player, uses premium natural organic products. It’s a part of the unique integrative spa experience. They encourage their clientele to incorporate the professional products into their home regimens. And here’s how they differentiate themselves at Spa wumurdaylin. They use pure botanicals from organic Australian native plants in their products. Pure, natural products. Carefully selected spa products from Waterlily have been chosen to provide a unique indigenous experience that reflects the beauty of this magnificent setting. Spa wumurdaylin uses pure botanicals, organic Australian native plants, pure essential oils and no artificial fragrances. Port Douglas Day Spa offers the Comfort Zone Signature Special. A facial spa performed with products containing chia seeds, maqui berry, spinach and carnine. They are an authorised stockist for Comfort Zone, an exclusive Italian brand. Whereas at the Botanica Day Spa, they pride themselves on using unique branded products. They’re an exclusive stockist of leading luxury spa and skincare brand Elemis. Their therapists carefully select specific skincare products to suit each clients’ needs. It’s a one-of-a-kind bespoke experience they’re aiming for. Spas have always been associated with affluence and luxury. Day spas pride themselves on being secret hideaways where people can reach a sense of well being. A place where they can be treated like royalty. And the breathtaking interior design is one of the first things people think of when thinking about a spa. Without a doubt, you need state-of-the-art facilities for your spa. You want to triumph in the day spa industry. And you’re going to provide your clientele with lavish experience. Nothing less than that will meet the requirement. But before you work out any sort of interior design plans, it’s essential to pinpoint what you clientele needs. And yes, having first-class facilities is a factor they consider when opting for a spa. So make them mind-blowing and customer-friendly. Equip your place with sophisticated furniture. Add classy massage beds and elaborate details like wall paintings and flowers. You can always make additional improvements to your spa interior. And that’s good, because that will help attract new and repeat customers. Add natural wood elements, sliding doors or screens. Create a warm atmosphere with ambient lights. Play around with illuminated wall panels and candlelight. Pack the place with exotic indoor plants and experiment with design. Get some inspiration from Spa Retreat Cary team who decorates their front desk with flowers. Or follow the example of Onsen Ma Spa. They chose a traditional Japanese bath house style as their trademark company design. It’s amazing how every little detail fits into the big picture. Try out some the ideas Nectar Day Spa incorporated in their spa interior design. They used granite, marble, brass and glass. Mirrors and chandeliers, designer wallpaper, stone benchtops and custom artworks. Playing it wisely with pool area will help you hit the big time with your spa business. Try amazing see-through pools impressive pool lighting. Or even add soothing poolside video projections. See how majestic a fibre optic ceiling looks like in a pool setting. Creating an inviting lounge area will inspire your customers to relate to your spa as a home away from home. Personal care, newfound energy, and a revitalized appearance remain invaluable commodities among consumers. But designing an opulent lounge area will give an extra touch. It will make your day spa experience extravagant. So, go for a blend of contemporary design and traditional elegance. Blend clean lines and warm functionality. Reserve a spacious area for your lounge. Nobody likes waiting in cramped waiting rooms with people breathing down their necks. Your lounge must offer your clients utter comfort and enjoyment. So, furnish it with comfy sofas and armchairs, a stylish front desk and soothing lamps. Spa Week online platform is a If you haven’t already done it, it’s high time you equip your lounge area with a mini bar. This would help your clients to unwind as soon as they step into your day spa. Or they can opt for a refreshing or calming drink after the spa treatments. Picture you loyal clientele resting and sipping tea in your perfect, relaxation area. Sounds fantastic, doesn’t it? Install water coolers in your waiting areas so your clients can get a cup of water whenever they need to. Last but absolutely not least, don’t forget to let the music play! It’s a universal activity and a custom deeply ingrained in all cultures. And this is not without a reason. Science has repeatedly proven that people are hard-wired to respond to music. So, press that play button and make your day spa a place of utmost enjoyment. A day spa should appeal to all of the five senses – sight, hearing, touch, smell and taste. All great brands target this as one of their objectives disregarding of the industry. But spa business is perfect for relating to the human senses. It’s a match made in heaven. We’ve already covered some of the touch, sight and hearing aspects heretofore. And you’re going to find out more about how the sense of taste can be addressed in a day spa setting in another section. But what we’re going to focus on here is the sense of smell and essential oils. Besides addressing a wide range of health concerns, essential oil infusion can help create a relaxing atmosphere. In your treatment room and beyond. Breathing in the exotic fragrances will make your visitors feel welcome. This will help them loosen up while waiting for the treatment. And that’s a crucial point for making the most out of your therapies. Research has proven that a scented environment incites better evaluation of products. It has also proven that it makes customers ready to pay more. Using scenting in all your spa areas will help your clients remember their experience vividly. Those good memories will inspire them to return. So, create a multi-sensory experience for your clients. Make scenting an integral part of your pampering rituals. And wait until you hear this: you can create your own signature scent! Fresh&Clean can help you develop a scent strategy to enhance your brand. We will take your customer demographics and brand values into consideration. Each essential oil has its own character and aroma, and your brand is going to get distinguished in the same fashion. Sign up and witness the difference scenting can make for your business. Endota Spa is Australia’s largest day spa network. They greet their visitors with their signature scent the moment they step through the door. So what are you waiting for? There’s an increased focus on wellness among spa-goers. Thus, you need to decide on your tactics to make your services up-to-date. Hosting fitness classes is a great way to assist your clients to stick to the path of wellness. But how about installing healthy snack vending machines in your spa? That’s another awesome way to support your clients in making healthy lifestyle choices. And it will make your service unparalleled since not many spas offer this kind of commodity. Kristin Carpenter is a director of Qua Baths & Spa at Caesars Palace in Las Vegas. She discusses on how health and wellness are integrated into the spa industry world. Ultimately, ‘spa’ is about life-enhancing experiences. Spas will continue to integrate wellness into treatments, food offerings, fitness studios and classes and to invest in relaxation spaces. Adding guest speakers, events and dedicated spa retreats teach clients how to bring wellness into their everyday lives. Introducing healthy snack vending machines is an on-point strategy. But examine other innovative ideas as well for a more wellness-driven business model. Somewhat unconventional for a day spa setting? Okay yes, but that’s what you’re aiming for, right? Being distinct and coming up with edgy ideas comes at a price, but making such risks can pay off immensely. Your business strategy must stay on the creative course. Even if it means implementing ideas that gravitate towards the quaint side. Creating a mini library in your day spa will send a message to the world that you’re not just any spa. It’ll show you’re thinking about your clients’ experience outside of the usual spa services. This will make your clients feel you genuinely care about them. Which, on the other hand, will make them feel comfortable and at home in your spa. The spa is not only about beauty and pampering. It’s about making your clients relax on every level. Having a unique regenerating experience. So, design a cosy reading nook your book-loving guests will delight in. Spa Week online platform is a 365 day-a-year resource for everything wellness. They offer a book club section on their website blog. It features interesting new releases and zooms in on mesmerising award-winning novels. They present their online visitors with extra content, aside from usual spa topics. This major shift in the industry towards a fully integrative focus is very good. It is going to unlock the world of fantastic new possibilities. So, take an individual approach by looking at the big picture. Target your clients’ unique desires. Build your name around not playing by the book and get voted one of the best spas in your area. You can go that extra mile and serve your guests food at your day spa. This will make your customers have not only a great experience, but an exhilarating one. Appealing to the sense of taste will take your guests on an ultimate journey of the awakening of all of the five senses. Trust us, they will be more than grateful for such a comprehensive day spa experience. Try this out. Then step out and look how “wow” and “oh my gosh” style comments start popping up on your social media profiles. Your clientele will be impressed by your business once you’re done with them. Aurora Spa has got a delightful Spa Breakfast offer. Their customers can enjoy a Morning Bliss breakfast before the spa manicure treatment. This is an example of a hotel-integrated day spa with the meal being served at the hotel restaurant. But there are various options for you to consider. In case of no restaurant amenities, you can partner with a neighbouring restaurant. Or even a catering service. Sounds convenient, doesn’t it? Ikatan Day Spa has done just that to get a meal addition to their spa services. 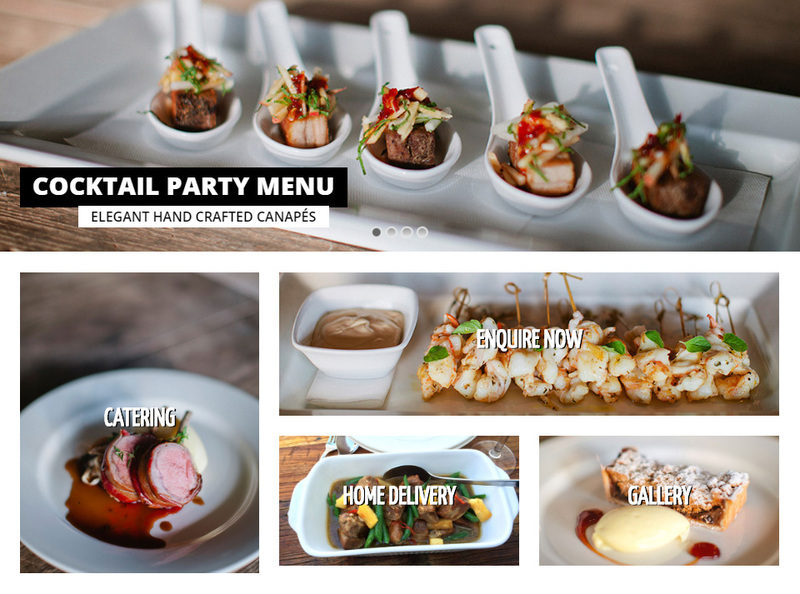 They’ve partnered with Rolling Dolmade Catering for an extensive offer. From large platters and single serves to taster plates and nibbles. So, think about it. Such a comprehensive offer will leave your clients fall head over heels for your place. Many people today have a thing for sneaking out of the office to loosen up a bit and let oneself go. They’re growing desperate to grab those few moments of the lunch break and pinch a bit of time for themselves. And a day spa is the perfect place to go. Scheduling a half an hour massage during a break on a stressful day – sounds like a good combo. Allowing more time for a multi-treatment pampering at the end of the day – is an absolute winner. People are struggling today trying to cope with a frenetic, fast-paced lifestyle. And that’s where you step in to offer them invigorating full day spa treatments. Your spa is that perfect place that is going to help them suspend time and draw a few breaths amidst the daily grind. That’s the reason why working in the spa industry is so rewarding. Sudden Echo Day Spa’s Express Destress Package where you can enjoy your very own SPA-CATION. Full day spa packages are tailored for total rejuvenation of the body, mind and spirit. So work out a thorough plan on how to select the best spa treatments. You and your clients both want to leave them looking and feeling refreshed and radiant. Also, you might want to create an individual approach. Introducing customised spa treatments will thrill your clients. With full day packages, you want to engage them fully. Allow them time to enjoy the sauna and pool area. Apart from indulging in your treatments, they could walk around the garden. Or maybe even enjoy a paperback or an audiobook in your green room. Aurora Day Spa offers a full day spa retreat. It starts with a signature massage and transitions into a hydrating facial. Next, their clients can relish a snack or a lunch. And the blissful experience rounds off with a manicure or pedicure of the clients’ choice. Ballarat’s Sanctuary Day Spa offers two different full day packages for customers to choose from. They complement it with a lunch at a neighbouring restaurant. Couples packages are getting immensely popular among spa-goers. Nothing strange, since they make for an elegant way to treat that special someone. And then get to share a relaxing and bonding experience together. There are special sets of facial treatments for couples, friends, mothers and daughters. And who would mind a duet massage as a way to share some quality time with a friend or as a romantic getaway? You can include side-by-side massage therapy, baths and steam showers. Add lounging time with chocolate treats and champagne after the treatments – and you’ve got some utter pampering. It’s always shrewd to draw inspiration from other successful spa businesses. So, check out how some of them combine their couples spa day packages. Ikatan Day Spa gives their customers a choice of four alternative couples spa packages. From 75 minute treatments up to 3 hours of amazing shared treatments. One of their packages includes a foot ritual, a 60-minute Balinese massage and a taster plate to share. Plus their customers get to access the garden. It’s where they can relish food items and a complimentary glass of champagne. Keturah Day Spa is a place of diversity. They’ve got everything. From a dual relaxation massage to a sea salt and essential oil body exfoliation. Their Couple’s Holistic Treatment includes hot stone massage, Katurah signature facial spa and a relaxing scalp massage. So, make an authentic selection of spa treatments that people will know you by. The sky is your limit. And your aspiration to reach for the stars will reflect on your profits. Make sure give it your best. One can never be too tired from continually updating one’s branding strategies, right? That’s something that requires you to put your heart and soul into what you want your brand to be. That’s how your spa’s unique personality starts to resonate. How you establish your distinctive niche in the market. Attract your ideal customers and build a pool of loyal followers. So you go on generating one idea after another, then get down to reinventing your spa story. Next, you contemplate on how to enhance your services with unique products, authentic design and a variety of therapies. So why not think in the same fashion when brewing tea to your customers? Serving tea is becoming a kind of a cliché within the day spa niche. So, flatter your day spa with an offbeat approach even to a common thing like tea. Be one of the few that will offer something different – exciting and extravagant tea blends. If you greet your customers with a cup of original tea, there are lots of devotees that are going to be happy about it. And besides, can there be a more welcoming gesture than a cup of an exquisite tea? Aside from a smile from courteous and helpful staff, of course. Let’s see how someday spas made magic with some tea. Park Club Day Spa offers their guests a Ginger Renewal Treatment. It includes a mineral body exfoliation, a warming ginger oil massage and a relaxing facial spa. Then they top it up – with their signature herbal infused tea. While at Ikatan Day Spa they strive to help their guests zoom out of the chaotic modern lifestyle. To savour the moments of their spa experience. They serve special T2 tea blends to their clients. A perfect way to disconnect from the hectic world and enter the world of stillness. Don’t you agree? The tea brand they’re using is launched in 1996 and it grew to become a go-to for tea in Australia. Producing only one-of-a-kind teas, their brand philosophy narrates the tale of tea experiment. Of tea excitement! Look how they played around to come up with this exceptional Little Bag of Gold brew. They concocted turmeric, rooibos, cinnamon, ginger and red pepper. Sounds thrilling, anyone? Another exotic blend they brewed up is their Mangoes & Cream blend. A smooth mango and coconut combo to feel the summer in the air, even if winter’s knocking on the door. Neat, isn’t it? Want to charm your clients with a cupful of blissful tastes like those? You won’t fall short of their expectations if it’s so. There aren’t many things that can put a smile on our faces as smoothly as hearing a word ‘complimentary’. So go on and make your day spa visitors happy. Provide them with small savoury items and desserts free of charge. Conjure up an image of your visitors munching delicious bites after relaxing treatments. This is that missing link that will make your day spa a favourite place for your clients. It’s complimentary! And it’s not a huge investment, by the way. Harbour Day Spa offers complimentary beverage and nibbles as part of their intimate escape for two packages. It starts with the aromatherapy massage, followed by milk and honey rose petal bath. The experience is rounded off by a complimentary glass of sparkling wine or beer. And some nibbles to enjoy on the private balcony overlooking the Raby Bay Marina. And every Ikatan Spa guest can enjoy a welcome drink on arrival and a complimentary glass of champagne or a cup of tea after treatments while relaxing in their gardens. There’s a lengthy list of things you can do to enhance your marketing efforts and attract new customers. You can let the word out about your specials and promotions. But mentioning the special little gifts you’re treating your new guests with will be the icing on the cake. Gael Wood, an experienced therapist, lists this as a tip in her ebook 50 Ideas for Massage and Spa Promotion. Free take home gift with first appointment. For example, a spa sampler basket with a small body scrub, body butter and mist. And as far as the regular clients go, she recommends giving spontaneous freebies. Enhancements, extra time or small take-home gifts, for example. Sounds like a great way to honour your clients’ loyalty, doesn’t it? If this sparked your interest, go and check the ebook out for more valuable insider tips. Want to see how others are doing it? The Ballarat Sanctuary Day Spa makes sure their clients remember them well. They give out beautiful spa gifts as part of their full day packages. And they go even further. Their clients receive exclusive gifts when they choose any of their signature therapies. Whereas at the Ritual Day Spa, customers get two products to take home as part of their Ritual VIP Treatment. And why not think about having spa gift baskets on offer, too? You can combine a selection of your finest products. From sugar scrubs and body butters to washcloths and tea bags. They make wonderful gifts for special and less special occasions your clients will love to buy. Here are some ideas on how to arrange them. A smart way to grow your spa is by branching out your services. And by enriching your space with multi-purpose rooms. You can start with creating a meditation room, a piece of paradise right in the midst of the frenetic city life. There’s an overriding need for a transformative journey in a place far from the stresses of everyday life. And city dwellers eager to reclaim a sense of wellbeing will run to you like bees to a honeypot. A spa expert, Kristin Carpenter, reflects on those growing needs. People are very focused on living a healthy lifestyle and are interested in improving their day-to-day lives. They increasingly want spa treatments and services that integrate a holistic approach. People are especially concerned about the far-reaching impact of stress on their health. So do you have any more doubts if creating a meditation room is the right thing to do? Well, we don’t. When creating a meditation room think about the minimalist design. Floor cushions, indoor plants, candling and small-sized rugs scattered around the room. Go for a serene look to inspire your visitors to work towards their inner tranquillity. Take a look at these compelling` meditation room design ideas. You can invite a licensed meditation practitioner guest to guide the meditation process. Or alternatively, a person from your team can guide the groups using mindfulness apps. There’s a bunch of fantastic apps on the market but go on and start out with Timer or Stop, Breathe & Think. Mindfulness is a growing trend in the wellness industry and for a good reason. One can only start to count its benefits. Harnessing our senses amidst the hustle and bustle of modern living can be challenging. It’s no longer that simple to pinch some alone time and just take note of how we feel or breathe. You can encourage your guests to do simple breathing exercises. When instructed a couple of times they’ll be able to practice them on their own. Organic Spa Magazine features a visual meditation room on their website. It’s packed with different natural themed videos. They present stunning nature footage accompanied by soothing background music. You can make use of these materials to present on a huge wall projector screen in your meditation room. It’ll take your clients on a journey through the forest, mountain and sky landscapes. Nice way to help them unwind. Second Wind Day Spa furnished a special room reserved for meditation purposes. Here, their clients can take time to tap into an inner place of inspiration and peace. Visitors are free to utilize the room during the entire stay at the spa. Or can take part in meditation and wellness seminars too. Latest spa trends gravitating towards integrative health and wellness. So, it’s important to scrutinize all the possibilities out there. Anything your guests can truly benefit from and that can help you carve out a distinct identity. Beth McGroarty, an industry specialist, gives her perspective on the prevailing trends. What’s driving trends is today’s state of unprecedented stress: being connected 24/7, the lack of boundaries between work and life, and the fact that by 2030, 80% of the human population will live in urban, nature- deprived areas. Spas need to position themselves as oases of unplugged human connection, and bring nature into the spa and people out into nature. Accompanying this is an almost anthropological quest for meaning and authenticity, whether in the form of Turkish hammams or spa owners growing their own herbs and performing treatments in gardens. But how can you compensate the lack of garden space and invite nature into your day spa? Well, you may want to reorganize your facial treatment rooms and refurnish one of them as your green room. If performers can have their green room to rest before and after the show, why wouldn’t spa-goers? They too have to switch roles and juggle them on a daily basis. Often ones they would very dearly like to take a rest from, too. So, wouldn’t it be lovely to create such a retreat room for you spa visitors? And then jam it with plants! An interesting venture, isn’t it? Indoor plants are known for their invigorating effects on humans. Furthermore, they can help reduce our stress levels, as reported in a 2008 Dutch study. Hospital patients surrounded by indoor plants experienced stress relief as opposed to those who didn’t. So, create your hidden green oasis for those seeking rejuvenation, relaxation and balance. Your guests could have a cup of tea in the room, read a book or have a chat with other visitors. Ambient lights and candling are reminiscent of day spas in general. But complement your green room with lots of natural lighting. Add plenty of colours derived from nature and some garden-inspired furniture. They all make us feel good. But opt for plant varieties known for creating restful ambience and air purifying properties. Here are top 10 de-stressing houseplants from HuffPost. It’s getting pretty daunting to meet the demands of fast-paced modern day lifestyle. The modern man is exposed to constant activity imperative and overwhelming technology stress. That’s why you should assist your customers to achieve a work-life and tech-life balance. Clients are now expecting a day spa to be an integrative body, mind and soul experience. Thus, day spas are upping the attractiveness quotient of their spa menu. Having an adjacent garden is a perfect way to do it. Maybe you have an access to a garden. Or you are located in the vicinity of a local park. Whichever of the two, using these green facilities will boost your spa business. The point is to take your day spa experience beyond the copy-paste paradigm. And is there a better way to reclaim a sense of wellbeing than by reconnecting with nature? So, provide your clients with a tranquil retreat in your refreshing and invigorating garden. Make a shift in perspective. A day spa doesn’t necessarily have to be an indoor experience. Ikatan Day Spa is a place blended into the beautiful natural surroundings. They use integrative approach and encourage people to feel connected. Imagine your clients having a few moments for themselves in a lovely garden like this. 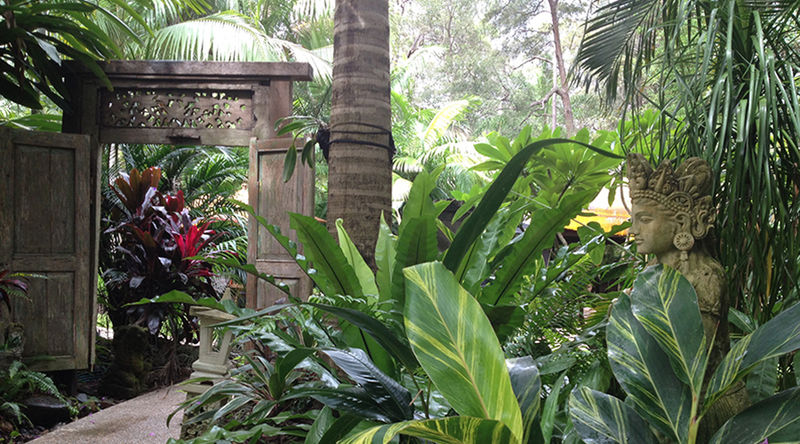 At Chuan Spa, they encourage their clients to take a walk around the neighbouring gardens. Offering them a serene space to take a mindful moment and draw a few breaths. This is a great way of providing your clients with an immersive all-day involvement. That little something that will distinguish you from uninventive, dull day spa businesses. The idea is to create a sense of a journey. Of a holistic experience, instead of them just undergoing individual spa treatments. Sounds like an unconventional thing to do, but when you look at it more closely, it can actually fit in. Even more so if you have a garden or an in-house green room. Picture this scenario. Your clients enjoying in the garden while listening to an audiobook or a podcast. Or some soothing and relaxing music. An amusing way for your clients to chill out between their treatments, let’s say on a full day program, right? So, go for it, switch that button on to help them switch off. Michelle Frye, a spa consultant, puts forth her idea of the pressing need to explore new modalities. With annual spa visits at an all-time high, spas will struggle to find quality service providers and will also be tasked with creating new and unique offerings. Spa-goers will have a lot more choices, so providing more customizable options will be key. Offering music on the go, or an audiobook to your clients is one of those innovative options. ’Cause, let’s face it, the changing client profiles urge spas to keep exploring which tracks to follow. This open-minded approach can lead your business to unending possibilities. Susie Ellis, the wellness pro, shares with us her savvy insight as to what drives the industry today. Everyone is a potential spa client these days. There’s so much research that substantiates the value of human touch and stress-reducing approaches. We have a stress epidemic, and we can all benefit from what spas offer, now more than ever. Spas need to constantly reinvent themselves. To meet the needs of their growing audience which is getting younger. And they’re all too digitally savvy. Think of it this way. You can offer your visitors podcasts by health experts or eminent life coaches. This could help in building up their wellness knowledge. And here’s a podcast series you can consider on How to Feel 22 at Any Age By Dr. Chandler George. This series can help your clients develop and nurture ageless energy of body, mind and spirit. Regardless of their age. They can also figure out how to find the right amount of stimulation they need to make them feel vibrant. You can browse the web for some soothing music ideas and play them on your day spa integrated audio system as well. Finally, what’s a day spa without some good old music? Check out these sources where you can download some calming music tracks or soothing piano pieces. Or search for a wider music selection on iTunes or Spotify. Of course, you should always bear in mind that you’re aiming at an unplugged spa experience for most of the time. But let them press that play button at times. And discover the beautiful world of your unconventional day spa. It’s not only your customers that need some enkindling ever so often, it’s your spa business, too. You know how sometimes things can get sort of stale. That’s just the right time to stir things up and revitalize your business. What you need is to create a unique selling point. A cutting-edge product or a service other businesses don’t offer. Try to make it happen by coming up with innovative workshop programs that are still rare in the industry. If you bring out wellness workshops as part of your day spa program, you’ll be making a smart move. Destination spas hold health and wellness seminars as part of their regular offer. Yet, it’s still hot stuff for the day spa industry. Here’s how Boldijarre Koronczay, president of the Éminence, organic skin care company, sees this gap in the day spa market. Spas will expand treatments by educating their clients through courses and classes, nutrition tips, fitness ideas, meditation, art, journaling, and many other ways to benefit their long-term wellness between treatments. So, brainstorm some ideas on potential themes and initiate partnerships with wellness experts. You can host workshops and seminars on a host of topics. Let’s say, natural cosmetics, mindfulness or balanced diet. Also think about music therapy, water aerobic classes or yoga workshops. Go for a cross-disciplinary focus. You don’t only want to help your clients have a relaxing experience. You want them to have a real blast! Yes, they need the renewal of mind, body and spirit but you need them to get swept away by your spa. And if you keep expanding your exciting new programs you will make your clients on the edge of their seats. Take Spa Vargas Wellness for example. They organise aromatherapy workshops, couples relationships workshops and corporate programs. Or Endota Spa which partnered with Vogue Australia for a series of wellness workshops. They teach on mindfulness, beauty and meditation. And don’t forget to spread the knowledge. Publish things like skin care routine ideas and natural cosmetics tips on your blog. And make sure to share them on social media like Spa Week and Ritual Spa do. Putting out some useful high-quality content out there will have far-reaching benefits for your business. Wondered how to entice your customers to book those mid-week and off-peak time slots? Mobilising your audience when they’re struggling with daily to-do-lists is challenging. You’ve tried out a few ideas but to no avail. And you’re all too familiar with a picture of your therapists’ idling around the spa on slower days of the week. Then next you know are crazed weekend days when everybody rushes in through your door. Now, how to fill those vacant appointment sessions successfully? Offer appealing mid-week discounts. Make them appealing enough so your clients know it’s something they don’t want to miss out on. This should do the trick. Making this offer an exceptional value for money will make the customers rush forward in no time. A low-cost way to promote this it is via your email campaigns. It’s where you’ll offer cut-rate, last-minute offers. Here’s how it works. Ryan Christie, the marketing manager at Local Direct Network will give you some insights. Harbour Day Spa offers a wide range of discounted mid-week offers. Mixing business and pleasure? Not sure what to make of it? According to conventional wisdom such endeavours end in disaster. But let’s look at Entrepreneur Magazine’s Step-By-Step Spa Startup Guide. It elaborates on the topic when we introduce the word ‘spa’ into the equation. Day spas are reaping significant revenue by attracting corporate clients. More people are beginning to mix business with spa pleasure. Private companies, non-profit organizations and small business owners are increasingly using spas to build relationships, motivate employees, and manage employee health. Spas serve as a catalyst to improve the quality of life at work. Workplace wellness programs are high in demand today. Corporate spa services bring whopping revenues. So, introducing a wide range of offers for companies is a common thing for day spa businesses today. They offer beauty spa pampering treatments and tailor-made spa retreats. But some even incorporate mobile spa services or hosting corporate events, as well. Business owners see day spa visits as an invaluable opportunity to reward their employees. So, the custom-built services aimed at corporate target audience are rich and diverse. We present to you various corporate programs from different spas for illustration. At Ayurve Day Spa companies can make group bookings for up to 10 people. They offer elaborate Corporate Gift, Team Building Activity and Employee Rewards programs. Companies are invited to sign up for memberships delivering special corporate discounts. Spa Retreat Cary offers customized day spa packages with 10% group discounts. They organize group massage spa retreats. It’s where coworkers can savour a full day of spa pampering. The guests get access to a dining space, makeup room and a workspace. The alternative to choose catering services adds up to this unique spa experience. Botanica Day Spa has a unique selection of corporate gifting programs. They reach out with Corporate Rewards, Catering Upgrades and Corporate Gift Cards. The rewards can be used for mid and end of year celebrations, as corporate incentives or gifts. They offer an extensive menu of luxurious spa services that can be tailored to individual needs. Last but not least, Champs-Elysees Day Spa can cater for groups of up to 20. They can tailor and personalise corporate events to suit individual company requirements. They also provide workplace chair massage spa services for some on-location pampering. So, what will be your corporate wellness day spa offer? Whichever tactics you choose for managing your day spa business, stay loyal to your customer-driven strategy. People today express a growing need for finding a place where they can ease off and relax. And they want it not only for themselves but for special people in their lives as well. Thus, issuing wide-ranging gift certificates and spa vouchers is becoming a common industry-wide practice. They range from holiday-inspired gift certificates to anniversary, wedding day or birthday spa vouchers. There can never be enough occasions for some satisfying day spa indulgence. And it’s always a good time for you to collect some extra revenue. Here’s what The Entrepreneur has to say about gift certificates revenue-wise. One aspect of salon sales that can generate serious income is gift certificate sales. Many salons offer either plastic gift cards or low-tech paper gift certificates as a way to corral more cash during those all-important gift-giving seasons, like the December holiday period, Valentine’s Day, and Mother’s Day. What appears to be typical is a gift certificate sales rate of about 10 percent of overall sales. A spa expert, Gael Wood, has listed some clever ideas for gift certificate promotion. She suggests adding a +1 gift certificate for the buyer when purchasing three gift certificates. Next, she advises including a set of your spa’s sampling treatments. That’s how the recipient can try some treatments they haven’t tried before. As for the marketing tips, she touts handing out flyers in man-frequented places. Such as gyms, hardware stores and barber shops. Though they might not be the craziest fans of spa treatments, they know their ladies are. At Spa Retreat Cary they offer many relaxing treatments within the gift card program. People can purchase their gift cards online or in complimentary gift wrapping. At Nectar Day Spa their clients can purchase a wide range of gift certificates. They combine facial spa, massage, manicure and pedicure offers. But what if some of their clients remembered their special date at the eleventh hour? Well, they have them elegantly covered with their instant spa vouchers. At Endota Day Spa, however, the gift cards are redeemable at any Endota spa location. Clients can exchange them for any treatment or product of the same value. Or they can upgrade by paying extra. They’ve prepared a wide array of gift cards for their clients. From full-organic body and face treatments and deep recovery messages to non-invasive LED light therapy. Yet, the absolute favourite is their Freedom Gift Certificate. It allows freedom to the buyer and the recipient to choose the right pricing and services. 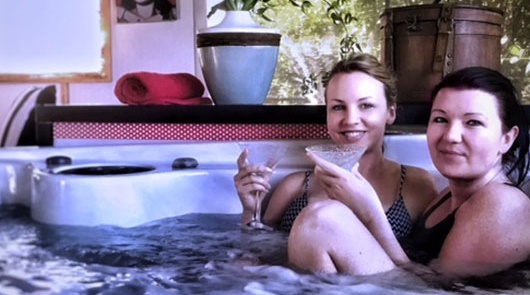 When it comes to all the nuts and bolts of running a spa business, it can get hard to cope. But if you keep running specials and discounts favoured by your spa-goers, things are going to happen. Making promotions such as service packages is a way to reward your clients for loyalty. And keep them coming in regularly, too. But how about making some exclusive, mind-blowing deals within time-limited promotions? 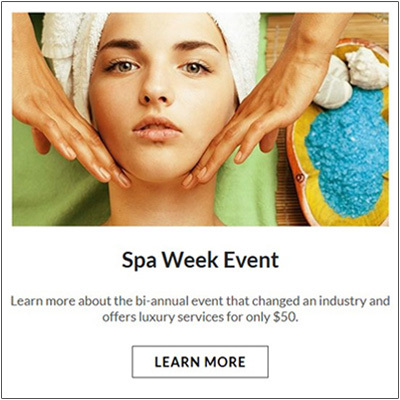 A USA wide Spa Week Event showcases that luxury doesn’t always have to come with a hefty price. What they do is offer some serious discounts on spa services nationwide. It’s a bi-annual event created with an average customer in mind. So average customers can experience luxury day spa services for an affordable price. The goal was to bring the spa and wellness experience to the masses. To offer them full-service treatments, normally costing hundreds of dollars, for just $50 dollars each. The Spa Week is organized each April and October. Hundreds of spas and wellness locations across North America take part in this major spa event. You can do something similar with your day spa to reach a larger target market. Drastic discounts like these will set your clientele on fire. So make this happen and give them something to talk about. There’s a crazy demand for day spa industry services today and a killer competition out there. The only way to get on in an environment like this is to make sure you gain a competitive edge over your peers. Be confident that you’ll make it if you keep constantly learning and investing in your day spa. Most of all, do not hesitate to pursue your dreams to go big. All you need to do is go all in and success is guaranteed. It takes a lot of determination and hustle, but if you want it bad enough, it’s yours. Whatever you do, you should never grow tired of reinventing your day spa. You can earn more revenue by being creative with every little detail of your spa business, top to bottom. Plus, if you keep generating new creative ideas, this will make your clients over the moon at the same time. Some suggestions we’ve put forward may be just the right thing for your spa, while others may not. So, chew these ideas over and make a rough guesstimate as for what can work for you. Take no stone unturned. Then take action. Remember you are behind the wheel. Stay true to customer-driven approach so your customers can only marvel at the way you treat them. Not sure where to start? Take the first step. 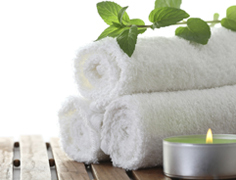 Partner with Alsco for a day spa towel rental and let us help you treat your clients with plush and luxurious day spa linen.